Breakers are powerful tools that allow workers to break through even the toughest of materials, making them essential tools for any construction site. These tools use hydraulic force to break through concrete, plaster, tiles, brick, masonry, tiles, and even road asphalt and piping. The compact nature of these tools makes them able to target specific areas easily, while the powerful voltage that they provide allow them to get through any materials as quickly and simply as possible. There are many different brands and tools offered under the breaker category. The type of tool chosen at the construction site will largely depend on the project. In this guide, we take a look at the three types of breakers – light, medium, and heavy – to explain how they can be used on site. Breakers are used on a construction site according to the job at hand. For smaller jobs, a light breaker will do just fine. For heavier jobs, a medium or heavy hammer would obviously be a better choice. Using the right tool for the job is vital to be sure that your team is able to break through materials with minimal resistance. Here is how each type of breaker hammer could be used. These breakers are typically used for smaller surface corrections, most commonly on materials such as concrete and masonry. These breakers would be used to remove relatively small surface imperfections on concrete walls or flooring. They could also be used to remove plaster and tiling or to remove rust and paint from steel. They are also used to expose stabilising bars prior to concrete repairs. They can also be used for light chiselling on brick as well as corrective chiselling and concrete finishing. 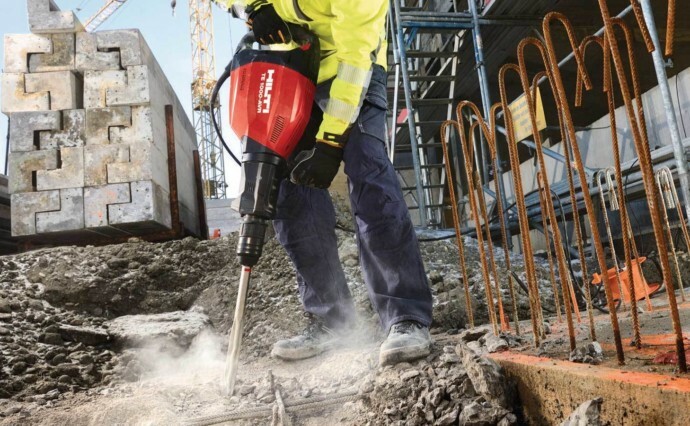 Medium breakers are typically used as concrete demolition hammers and will be selected for projects that require more pressure and work to remove or breakthrough materials. Medium breakers would be used for medium demolition projects to remove concrete foundations or slabs. They could also be used to remove concrete to prepare for rebar connections or utility connections. They can be used to dig or tamper earthwork, remove plaster, tiles, windows, and door openings, and to roughen surfaces. Some may be used for selected masonry removal on walls. Heavy breakers act as heavy-duty demolition hammers. These breakers would be used for breaking through concrete flooring, walls, road, and other tougher work areas. They can be used to expose foundation reinforcement, remove or clear space for stairs and risers, or shafts. They can create large channels in flooring that are used to lay down piping. They are also used in heavy-duty roadworks such as breaking through asphalt for sewer maintenance and other surface renewal projects. Need-A-Tool offers a large catalogue of breakers in Durban, with a range of breakers in all light, medium and heavy categories available to rent. Browse our catalogue or contact us today for assistance in finding the ideal tools for your construction site project.